This bowl is typical of the Millions made in the multitude of kilns in this valley over some 200 years during the Song Dynasty. 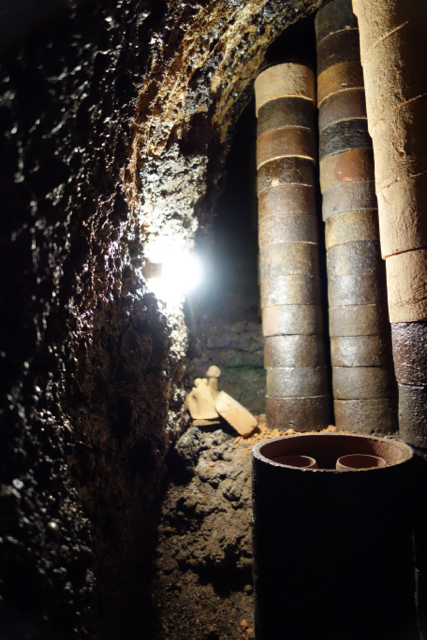 It is small, the clay is rough and it is surprisingly thickly thrown and turned. 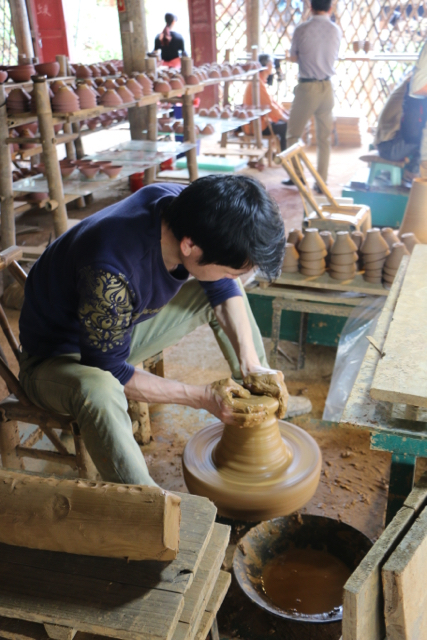 I can visualise its maker, sitting at his Chinese style kick wheel, throwing a large lump of clay onto the wheel, roughly centring it before separating enough clay to make this bowl. Like he had done perhaps 10.000 times before, at least 100 times that day, caressing the clay lump with his two hand, coercing it with gentle but persuasive pressure to the centre of the wheel head. He would then use his thumb to open it out, forming an indentation that had just a hint of the bowl of the come. Now he would shift his hands almost imperceptibly, using the fingers of his inside hand to again gently push the clay across the base and, very subtly, to lift up. At this very point his outside fingers would collect the clay and by using the sensitivity developed over years, pull the clay up and out to form the basis of his bowls shape. Having done this so often without even looking at the pot up until this point, he would still have a quick glance at his work before picking up a rib to shape and smooth the inside of the bowl, do the same on the outside, then cut a little of the clay at the base to form a V for the cutting wire. The inside form is settled using a rib to ensure it is uniformly shaped which is assured by the repetition of this act of throwing these bowls. It is the rim that needs the last bit of his skill. Using the the side of his thumb, like I and every other thrower has done time and time before, he holds it up against the rim and gently presses inwards to ensure there was the little indentation on the inside of the bowl. 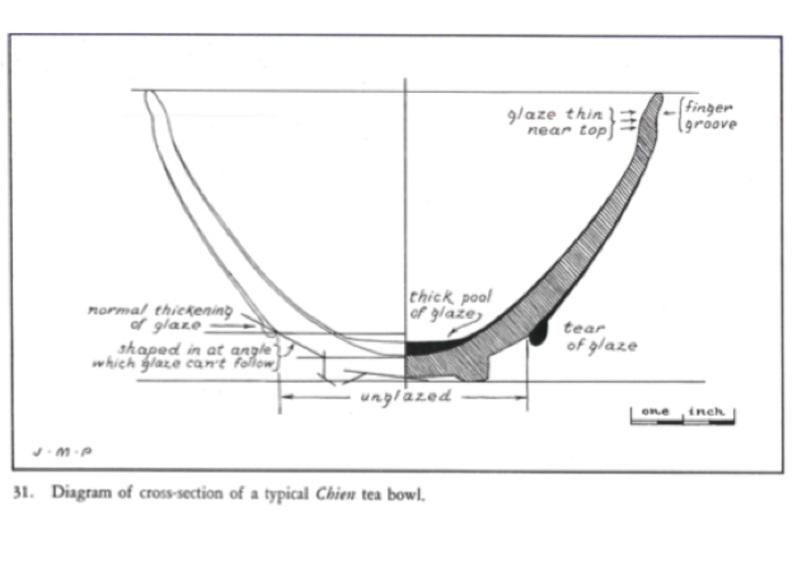 It is this detail that is so important to the functionality of the Tea Bowl, ensuring that in the act of whisking the green tea that the liquid fall back into the bowl not over the rim. The potter would then let the rim run through t he web between his first two finger, just pressing down enough to compress it, making it lip smooth and at the same time strengthening the point where cracking is most likely to start in the firing and ruining the bowl. Satisfied with his work, in all likelihood this process would have taken less than a minute to execute, he would used a single piece of cord fed into the V at the base of the bowl and with a practiced flick separate it from the clay below, at the same time catching it with his other hand and placing it on a ware board before beginning the process again. The next day, he brings these pots to his wheel and places each one on a chuck attached to the wheel head to turn it. 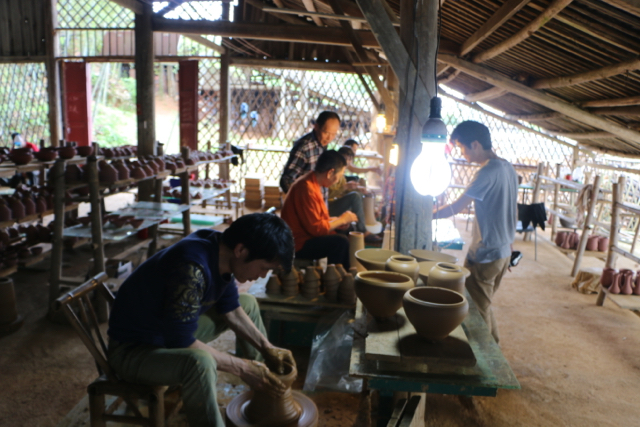 Using a sharpened bamboo or steel turning tool, he first taps it to centre then quickly removes the excess clay to get the basic shape. Using finer tools the potter refines the outer shape and cuts the foot rim into it. Firstly he defines the outer edge then uses a loop in his tool to hollow out the clay in the base to give a ring of clay for the bowl to sit on. 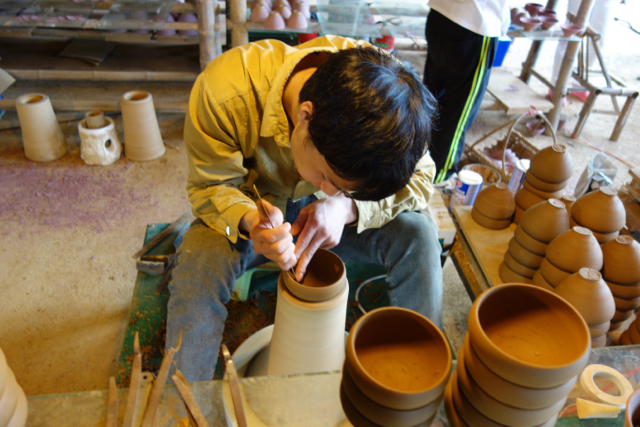 The potter repeats these actions until all his pots are finished. The potter then prepares his slip glaze ready to dip the pots into. 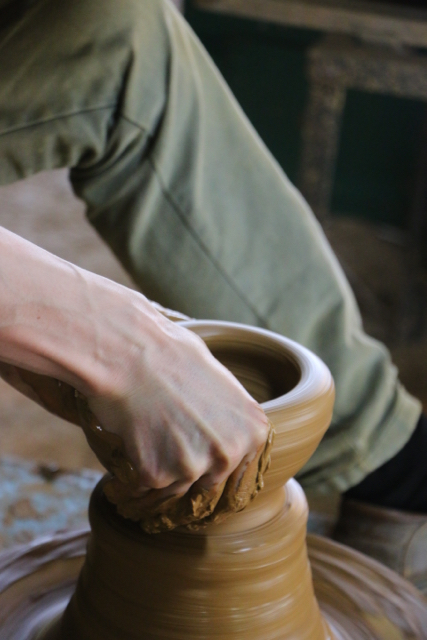 The foot ring has been designed so that he can grip the leather hard clay with his fingers and dip the pot into the slip right up to the foot and them pull it out half way and with a flick of his wrist push back making the glaze trapped inside bubb le up and coat the inside of the pot. All this he do es in one expert and fast action, so fast that if you blinked you would miss it and marvel at how he had been able to cover the inside and outside of the pot in one dip. Once the glazed pots had dried out they would be set on a small lump of fireclay and placed inside a sagger, one for every pot, before being stacked in the kiln. 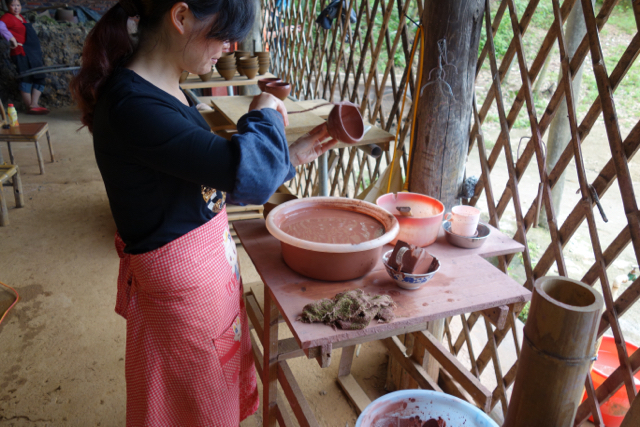 In all likelihood these potters were seasonal, working in the fields to plant, tend and then harvest crops. It is most likely that they would work in groups probably village or family groups, and have communal space it the large village kilns. 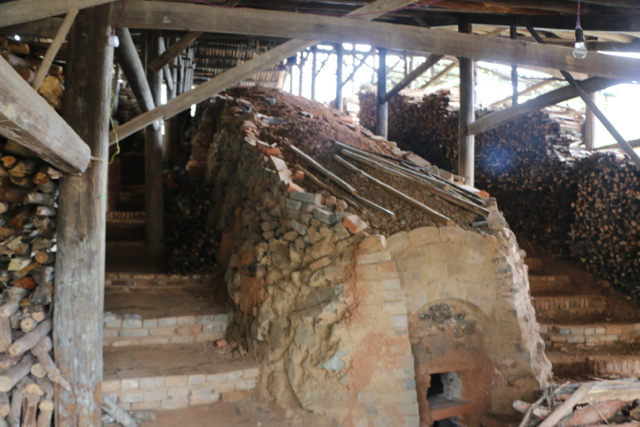 The stacking and firing of the kiln was a mammoth task, as you can see from the photo of one dragon kiln, they are huge. A whole village would come together to help. They were fired with wood all of which had to be collected and seasons at least a year before the firing. The firing would start at the lower end in a firebox at the front an it would probably taken all of the first day just to bring the front of the kiln up to red heat as these raw pots are always lightly wet and if you heat them too fast when the waterer turns to steam they explode with catastrophic result, by the second day the front of the kiln would be up to temperature and the potters, or possibly professional stokers would then work their way up the side of the oils stoking until that section was complete and moving ver upwards to the end. This is a very efficient way of firing as heat from the hot zone is preheating the pots further up the kiln. 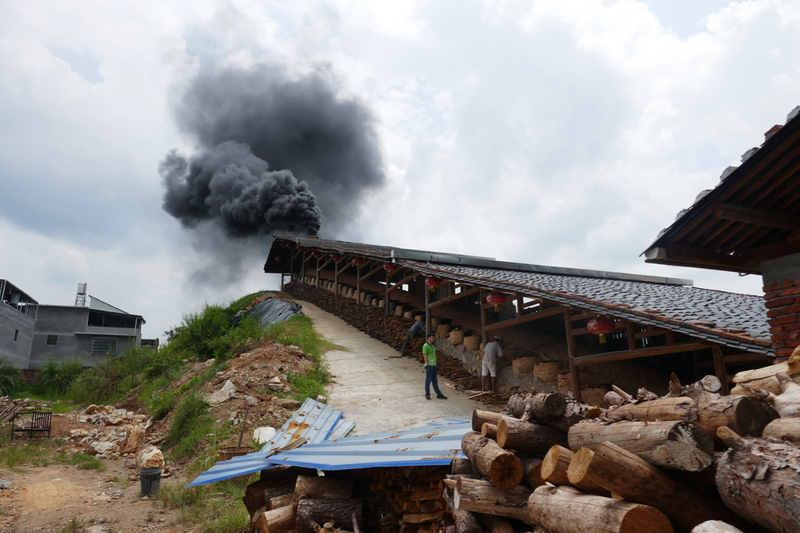 It would take several days for the kiln to cool down after a firing, possibly a week. It is then and only then that the pots can be removed and the unsatisfactory ones thrown on the shard pile, the acceptable ones packed up for market and the few gems put aside for to be given to the Emperors Court. Given its survival for some 800 years I would put this bowl in the latter category. What is it about this bowl that captures my attention? I’m sure the appreciation of beauty is a universal search and that the majority of humans will pick the same objects as having that quality. I know that the Chinese and the Japanese for over 800 years have held bowls like this one up to be ‘the standard’ of beauty, and certainly in the west there has been a conisureship that has developed around Asian ceramics that agrees with that standard. 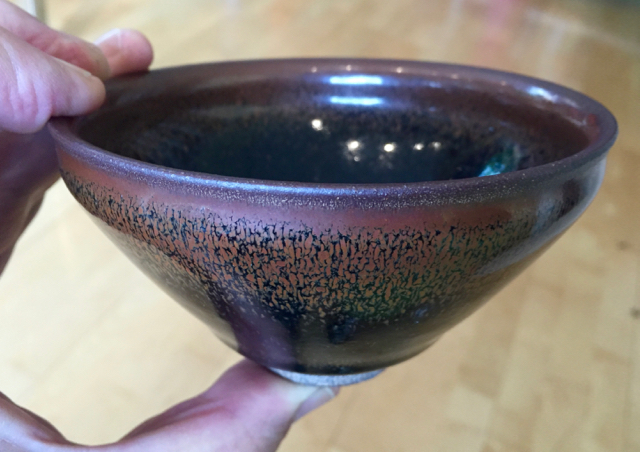 I would be surprised if the large majority of ceramic practitioners didn’t hold a similar opinion, but I can not be sure it is universal, though I know that I love this bowl and aspire to be able to create bowls as beautiful. When I start to analyse the bowl I start with the proportion of the foot compared to the upper rim. There are two aspects at work here, the smaller the foot the greater the tension created and the less stable the bowl appears, the reverse is also true, a wide base imparts a feeling of stability but lacks elegance. This bowl has a perfect dynamic between the two, the proportion of the foot suggested the bowl is stable whilst at the same time it is small enough to give it a sense of elegance. This foot supports the bowl and provides confidence that it will not tip over easily but it also does not weigh it to the table, rather it intersects with the beginning of the upward thrust of the curve that is the bowls wall dynamically. This curve is a compound and the upward thrust hesitates just below the rim at an indentation, that appears on first examination as an afterthought. This indentation is formed by the potter’s thumb, and serves two very important functions to distinguish this as a ceremonial Tea Bowl. Firstly it acts to ensure that during the preparation of the finely ground green tea powder using a fine bamboo whisk to whisk it to a perfect froth, that the liquid does not go past the indentation and spill over the rim. Secondly the groove ensures that the rim is positioned in the perfect position on the lips so that the ritual tea flows easily into the mouth.This latter is a similar concept to that developed by the glassmakers Reidel with their varietal specific wine glasses. Each wine glass is design to match the characteristics of the individual wine variety and ensure that wine is delivered to the optimum position on the tongue for that variety. If you have experienced these glasses you will understand how perfectly they feed the wine into the right receptors on the tongue and ensure you get the maximum pleasure for the wine. This Tea Bowl is designed to do that with the tea prepared in it. It is that recognition that the maker has made a bowl which perfectly serves its purpose, that is made thickly to keep the tea hot, yet is made of the materials at hand in that little valley, a high iron clay glazed using a glaze rock mined nearby, a combination that could only be made in this place. It is this connection with place and the people who lived and worked there to make it that humanises it. This is highlighted by that indentation at the rim, made by the potter’s thumb.